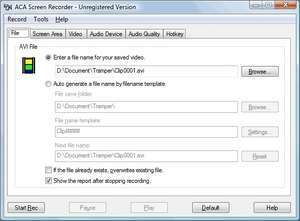 ACA Screen Recorder is a windows screen recording software, it records the screen actions and sounds from the microphone or internet radio, saves it as a standard, easily edited, Windows AVI (*.avi) movie file. This format can be played under Windows, as well as the Internet, unlike other programs that use proprietary formats that may need special viewers and be difficult, if not impossible, to edit. For security reasons, you should also check out the ACA Screen Recorder download at LO4D.com which includes virus and malware tests. Additional screenshots of this application download may be available, too. Offering one of the most comprehensive listings and software reviews of video capture program for Windows and beyond. Users are provided with technical support via the video capture user forums. Check out some of the freeware downloads available in the video capture software category. They contain no strings and are available at zero cost. 3 out of 5 based on 4 ratings.